When dogs are biting, chewing and licking their fur excessively, this typically results in hot spots. Hot spots encompass various forms of dermatitis, commonly exacerbated by biting and chewing affected areas. Bacteria that naturally inhabit the surface of the skin then proliferate, resulting in further irritation. 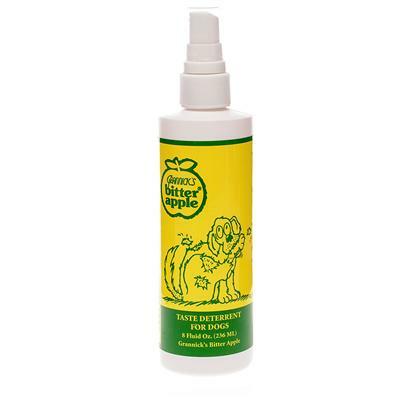 Grannicks Bitter Apple Liquid is the most widely recognized, best selling over the counter product of its kind. This liquid is applied to the affected area(s) and starts working immediately by producing a bitter taste that dogs find repulsive. The liquid is harmless to your dogs, but a potent deterrent that they simply can't stand the taste of. It is innocuous enough to protect your beloved dog, as well as your beloved furniture, because it is safe to use on plastics, metals and finished woods. Not for use outdoors. May stain surfaces. Avoid spraying in eyes. Shake before using and apply topically only. Can be applied as often as needed.